Russia's Alexey Timofeev (Photo: Jeffrey Au / WCF) wins the KW Fall Classic, defeating Rob Ainsley (Toronto, Ontario) 9-4 at the K-W Granite Club in Waterloo, Canada. Timofeev with Alexey Stukalskiy at third, Artur Razhabov and Artem Shmakov on the front end take home the $2,000CDN first place cheque along with 22.596 world ranking points, while Ainsley receives $1,400CDN and 16.570 world ranking points for their second place finish. Starting with hammer, Ainsley scored 1 in the first end, then forced Timofeev to a single in the second end. 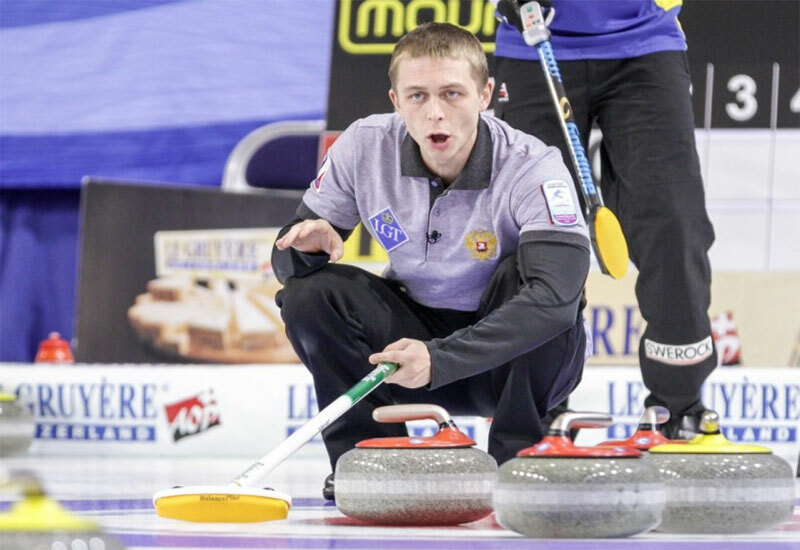 After Ainsley scored 2 in the third end, Timofeev responded in the fourth end scoring 5 to lead to 6-3. After holding Ainsley to a single in the fifth end, Timofeev responded by scoring 3 in the sixth end for early handshakes and the 9-4 win. In the semifinals, Timofeev defeated John Willsey (Kitchener-Waterloo, Ontario) 9-2 and Ainsley defeated Pat Ferris (Grimsby, Ontario) 7-1. Ferris and Willsey earned $1,100CDN and 12.804 ranking points for their semifinal finishes. In the quarterfinals, Timofeev defeated Ian Dickie (Mississauga, Ontario) 8-3, Ainsley defeated Richard Krell (Kitchener-Waterloo, Ontario) 8-4, while Ferris defeated Charlie Richard (London, Ontario) 6-3 and Willsey defeated Paul Moffatt (Waterloo, Ontario) 4-2. Richard, Moffatt, Dickie and Krell earned $700CDN along with 9.038 ranking points for their quarterfinal finishes. Timofeev went 3-2 in the 16 team triple knockout qualifying round. In their opening game, Timofeev lost 8-7 to Ferris, then lost again to Richard 6-1 dropping the team to the C-event. On their last life, Timofeev responded with a 5-4 win over Xiu Yue Ma (Beijing, China), then won against Ed Cyr (Fredericton, New Brunswick) 5-4, and Andrew Stopera (Briarcliff Manor, New York) 5-1 in the C-Qualifier to reach the playoffs.